Countless collaborations, peer-to-peer and the alternatives open souce have reinvented the way we produce and use goods, resources and services, leveraging the power of communities. Crowdsourcing is an online practice that relies on the design, construction or development of a project, idea or object to an indeterminate group of people who work to produce it. It is based on new factors of production that cognitive resources are underutilized and not organized previously. In this innovation in the production process is supported by a product innovation. During the nineties, in Europe, the independent mapping projects have been an essential component of social and political activism. Maps of evictions of military industries, polluted earth were the cartographic representation of social conflict. In these maps, always in those years, was flanked by other practices that arose from the discovery of psycho-geographic and situational, and that their construction mixing experienced and recreational practices. Began to germinate the idea that everyone could build their own map drawing from the reservoir urban imagination. If the mapping has always been an instrument of power and representation (inclusion and exclusion), the stimulus that was born was to actively transform tool, with all the implications on the systems of representation. When in 2005 is launched Google Map, suddenly, our research in web ordering on the Earth's surface, in the flat representation of the world represented by the figure of the map. But not only that, a year earlier, Open Street Map opens up the possibility of being able to build and contribute to the construction of maps. Emerges as an active practice in the shadow of the kingdom of the web: the collaborative mapping presents the experience as a voluntary activity of a multitude of neogeographersof urban space and of themselves. Since that time in the web 2.0 multiply the experience of use, creating and sharing maps, and geographical exploration in the network becomes the representation of assiduous territories. Compared to the past, these maps tell us not only of the daily experience of the city but also from the experience virtual real is produced. A second type of sensible maps, built through the analysis of user-generated content, "track" in real-time urban polyphony composed of emotions, passions, desires related to the places of the city or the services (Vitellio, 2013). The neogegraphy has as its driving force not only the product (map) in continuous evolution, but "who" produces it (the crowd ) and "how" (outsourcing), and the map, for many passive instrument of power or of location, orientation and measure, it becomes active and generative space, lending itself to accommodate a variety of languages (texts, images, videos, sounds, etc.) in continuous interaction and cross-reference each other. Now, it is no longer to read the map, but to write it by opening all the dynamics of crossing possible. The mapping is in fact the result of a variety of movement patterns, of different ways of using and experiencing the space, as well as different and implicit world views and potential to transform it. The map is a practice of building space that returns the geographical metaphor of the urban narrative described Ash Amin and Nigel Thrif (Amin, Thrif, 2002). The variety of initiatives of interaction and co-experience on the maps tell us of a an area of innovation assiduously built and rebuilt through a multi-ferment, organized and self-generating, which is transformed into its making social innovation: hence the saying and do find their expression in a practice of re-conquest of space. If the challenge launches social innovation is to "take back the space and give it new segments of existence, reworking old models", these initiatives appear to restore the centrality of the space. A multitude of experiences that come from below and self-organizing, requiring it to look at the number of public spaces and to recognize how to configure "other" model building "public" space. These practices tell us how, often through processes of appropriation "spontaneous" and alternative uses of space, there are a variety of forms of urban and sharing a common planning founded on the ability to explore the transformative potential of the place and also only imagine the relational space read through initiatives and low frequency. We are told also of the plurality of public space that emerges from the multiplication of the possibilities and the variety of urban crowdsourcing platforms. Finally, tell us that, in the innovation process has over the "making available" of places (real and virtual) experiment where possible, to share, learn and play with tactics positive-sum, rather than the institutional commitment of funds or instruments , because the network is able in some way to produce them.The city that emerges from this renewed production of public spaces is presented as well as open source , and continually constructed and reconstructed through the public free of cooperative computing software. The city open source , open text, in fact, is built through constant experimentation of the cooperation and decoding processes of interpretation, in which you fill in the gaps of an environment abandoned or "prescribed" , with temporary appropriations that catalyze creativity dispersed through tactics and imaginary subversive , distorting , subversive reversals silent . Compared to the past , new technologies subvert the looks of the city and its inhabitants which , no longer citizens of users and / or users of public spaces, but the protagonists, often informal and temporary, of their places of life, able to give meaning and significance the public space . The many experiences of urban crowdsourcing that develop a collaborative mapping appear subscribe fully a part of the Human Smart City where the digital platform becomes the space in which the expression, information and interaction is not only available to people and organizations, but it is from these collectively produced. 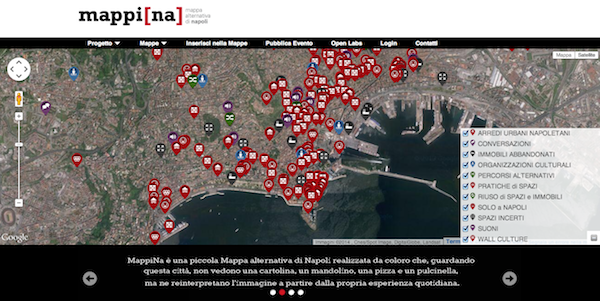 Under this horizon shows the project MappiNa - Mappa Alternativa di Napoli (Alternative Map of Naples), a platform for urban communication built through collaborative mapping, aimed at creating a different image of the city through cultural and operational contribution by its inhabitants. We know that every city has a stereotyped image which is projected outside its boundaries, but sometimes in this respect Naples seems to suffer more than any other city, in spite of the intense creativity of the Neapolitan people. Mappina's intention is to intercept the variety of languages used to express the city and facilitate open readings, expressed by the multiple, variable, imaginary, diverse voices heard in the city. Mappina is founded on that hidden texture emerging as a result of the initiatives of its inhabitants, who are co-producers of change playing on experimentation and emotional symbolism, on appropriation and rooting. To do this, Mappina addresses to the Naples that produces stories and images and not to the Naples narrated in books, postcards or travel guides: Mappina talks to people such as students, culture and art professionals etc., who, when watching this city, do not see a postcard, a mandolin, a pizza or a Pulcinella, but reinterpret the city image starting from live everyday experience. 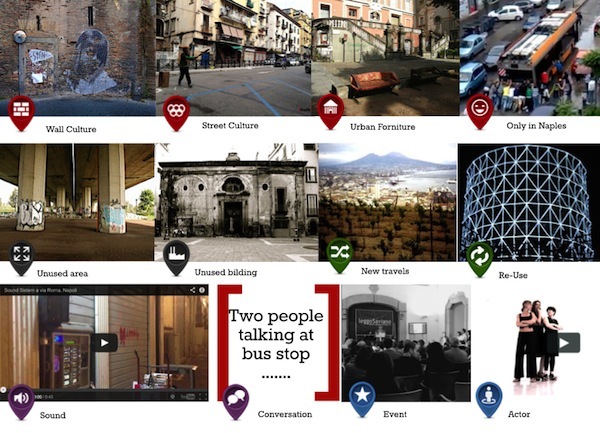 An image of Naples that the project links to the urban culture expressed in street art and street games, in unexpected encounters, in the practices of use of public spaces, in recycled and self-produced street furniture that make comfortable the city (Map of Places), in sounds and voices heard in the streets (Map of Sound), in its undefined spaces and abandoned buildings (Map of Unused) and in the possibilities of re-use (Map of Ideas), in the diversity of operators who produce culture and in the multitude of events spreading it (Map of Actor & Event). Anyone can geotag photos, videos , sounds and texts and so contribute to a new collective and collaborative narrative of the city. solicit alternative crossings of the city through the use of new technologies (App and AR), capturing new types of tourism, both internal and external to the cities, especially interested in the urban cultures who experience new languages. The goal is to reclaim the city's ability to be a tireless factory of images and imagination, a polyphonic matrix of possible worlds, composing through daily experience a collective map to open a different look; it is an occasion giving you alternative ways to transform the city. To this end, the project support both online and offline activities. Open labs trigger light and low-frequency actions on urban spaces. Workspace in audio-visual mapping will be available, with missions and crossings of the space, inviting the public to explore, critically rethink, reclaim and re- imagine these territories as a place of sharing, learning and experience, and maintain and enhance them through a creative and innovative usage, even if only temporarily. Mappina in Neapolitan is the worn out kitchen rag, used and abused, but useful in the daily usage of those who take care of the house. It is also a pun on "little map," in Italian. Building MappiNa is a bit like living in the city.